Finding the right ping pong table can be a difficult process. There are many brands to choose from and many different types of tables offered. In order to make an informed decision, you need to understand what qualities make one table better than another. 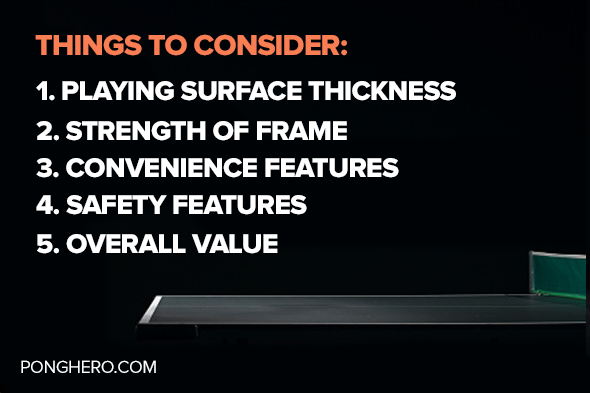 The five main criteria to consider when buying a table tennis table are: Playing surface thickness, Strength of Frame, Convenience Features, Safety Features and Value. Knowing what to look for will allow you to find the right mix of features for you, regardless of price point. We'll start out by covering "entry-level" tables. These are tables intended for recreational or first-time players that want an inexpensive way to start playing. They don't need to be ITTF certified, and they don't necessarily need all the convenience features of higher-end tables. With tables in this price range, Value is the key piece of criteria to make your buying decision. Does the table offer the right playing experience for the money, and will it hold up over time and continue to offer that experience? Tables priced under $500 are not going to have 1-inch thick tops, super thick stable steel frames or be made of bomb-proof materials. They also are probably not going to be ITTF certified. They can, however, deliver a decent playing experience at an affordable price. If properly taken care of, they can also last a very long time. Making sure your table is stored in a cool and dry place is the most important thing you can do to prolong the life of the table. For instance, the Joola Nova DX offers a tremendous value because it combines the quality and resilience of an outdoor table with the price of an entry-level indoor table. It's always at the top of the sales charts on Amazon because this table offers a heavy-duty welded steel frame, a weatherproof top made of aluminum composite, and 4 durable locking wheels all at a price under $500. This is a lot of table for such a low price, it's no wonder why this is always a best-seller. The Joola Inside Table is another great option to consider as it comes in $100 cheaper than the Joola Nova Dx and for the budget-conscious this could be very important. This table does not offer the same quality as the Nova DX as it cannot withstand harsh weather conditions, but it still makes for a great table for a very reasonable price (and free delivery) and for an indoor table it delivers a decent playing experience. In general, indoor tables tend to have a better, more consistent bounce when compared to similarly priced outdoor tables due to the materials used for outdoor table tops. Outdoor table tops are commonly built with an aluminum composite material that is waterproof and resistant to warping and cracking due to changes in humidity and temperature. 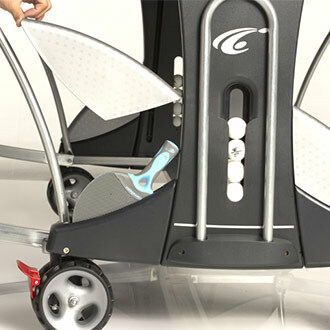 While this material is extremely durable, it often delivers a different, less uniform bounce. In recent years, these materials have gotten much better but they still typically cannot deliver the same playing quality of indoor tables that use a thick sheet of high-quality MDF that allows for the playing surface to be extremely consistent. However, outdoor tables are much more resilient. Quality outdoor tables can last decades, be stored in areas with high heat or humidity and can deliver a good enough playing experience for most people. We highly recommend that if you're planning to store your table in a basement or other storage area where humidity is present or frequent temperature changes occur, that you go with an outdoor table. Even if your just using it indoors, an outdoor table won't warp, rust or crack due to these types of issues and is a smart decision if there is any question about whether it will be stored in a cool, dry place. Once a table is delivered to you, you still must go through the process of assembling it. With some tables, this can be as simple as putting a few bolts through the pre-assembled parts and being finished 20-30 minutes later. With others, it's nearly an all-day process following cryptic instructions and trying to discern which parts are which. Sometimes, bad instructions can lead to you putting the table together incorrectly. At best, this means you are not using the table the way it was intended and your playing experience can suffer. At worst, it could be a safety concern and an improper assembly could lead to someone getting injured. It's very important to choose a table that is easy and straightforward to assemble. A great example of a table that is super easy to assemble is the Stiga Insta Play. Stiga put a lot of engineering into making this table capable of being shipped almost entirely pre-assembled, so all you need to do is unwrap it and you're ready to play. The table is also very light when compared to other tables in this category which makes it even easier to move into place and start playing. A table that has a reputation for being notoriously difficult to assemble is the Butterfly TR21. 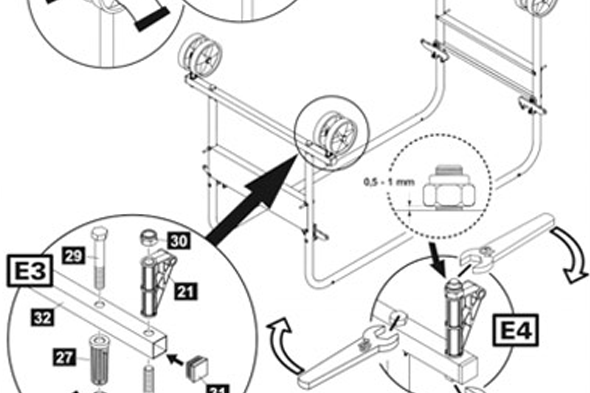 This table ships with instructions that have little to no text in them and they try to explain every step to the assembly process on a single page. On top of that, they ship the table with parts that all look the same so it's very difficult to distinguish them from one another. 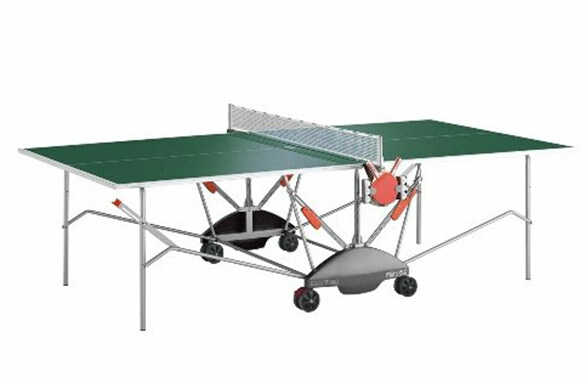 The mid-tier price range of ping pong tables includes quality tables built for the outdoors, like Kettler tables, and higher quality indoor tables, like those made by Stiga, that have more stable frames and a thicker playing surface than the entry-level models. This is a great price point for more serious ping pong players that want a long-lasting table with a tournament quality bounce. If you're a competitive player, you probably should be considering tables in the price range as you will definitely notice the difference from an entry-level table. The "tinny" sound of a bounce off a thin table top is something that intermediate and advanced players will hear, and the inconsistent bounce will negatively affect their playing experience. The Kettler Match 5.0 is a top-rated outdoor table because it is built to not only be completely weatherproof with it's sealed aluminum top, but it also has a near-tournament quality bounce and lots of safety and convenience features that make it stand out. Kettler uses a proprietary table top technology called ALU-TECH that consists of an sheet of aluminum with indentations that resist warping. 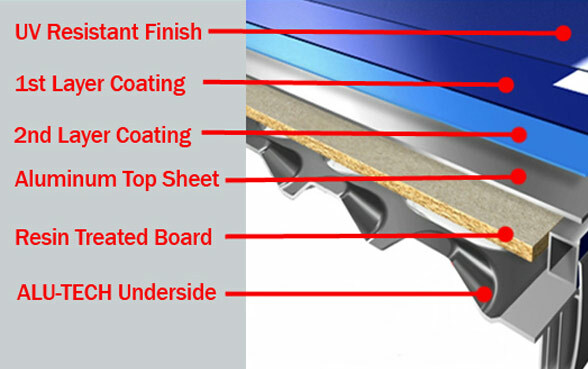 Encapsulated inside the Aluminum is a resin treated board that is permanently sealed to allow the table to maintain it's bounce for years to come, regardless of the weather conditions its exposed to. The Stiga STS 520 is a five-star rated table with a 1 inch thick tournament grade top. It's strictly for indoor use only. With it's beefy 2.5 inch heavy gauge steel legs, 5 inch ball bearing wheels and heavy duty leg levelers, this table is built to provide an exceptional playing experience. It also features Stiga's one full length ball storage system and a 2 and half inch powder-coated steel apron that makes this table rock solid. 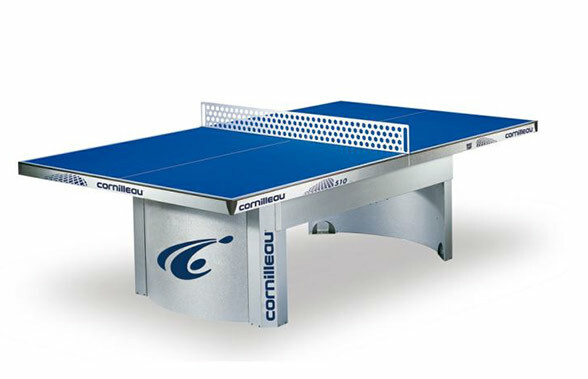 The Premium tier of ping pong tables is where you start seeing outdoor tables that have extremely high-quality, thick playing surfaces that play like tournament level indoor tables. You also see extra convenience features that aren't available in less expensive tables like covered paddle storage and fully adjustable nets. The Cornilleau Sport 500m Outdoor is a great example of a table with everything. It's got a top that plays like a tournament indoor table, has special ball and paddle storage that tucks equipment out of the way and is built to withstand even the toughest weather conditions. Other premium tables like the Stiga Expert Roller and Stiga Optimum 30 are ITTF certified tables that are used for official world table tennis championships. These tables are officially supplied to the 2012, 2014 and 2016 World Table Tennis Championships. They are constructed in Germany and built to provide the best, most consistent playing experience possible. It's important to note that these tables are indoor only and while they do offer an extremely solid playing surface, heavy duty frame and very high quality components, they are not made to withstand any amount of moisture. Another type of premium table is the stationary outdoor table. The Cornilleau Pro 510M is a good example of this type of table that is designed to be permanently affixed to the ground outside. This table is built with a 2 and 1/4 inch structual galvanized steel frame to support the 7mm resin laminate table top. With it's arched steel legs and permanent, tamper-proof steel net, this table is built to withstand anything. It also looks quite impressive and stands out as a professional looking quality table. Stationary tables like this are great for campuses, offices with outdoor space or backyards with space to permanently dedicate to a full sized table tennis table.